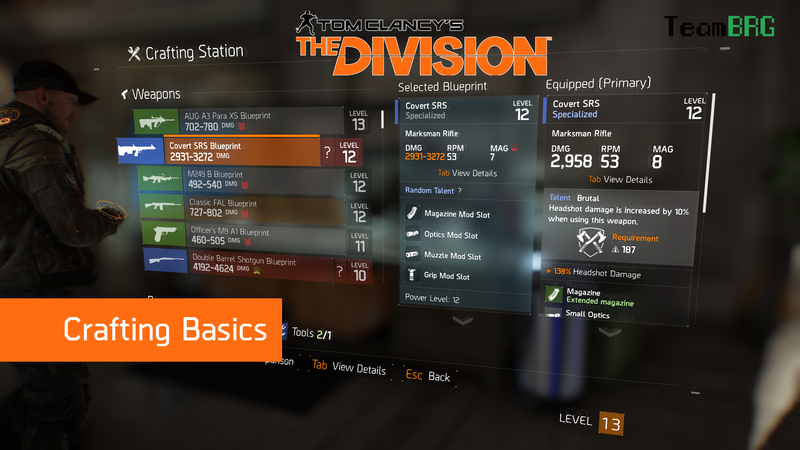 Crafting… In The Division? A shooting game… What??? OK – so you’ve unlocked your base and you notice that there’s a crafting station (It’s located beside your stash). 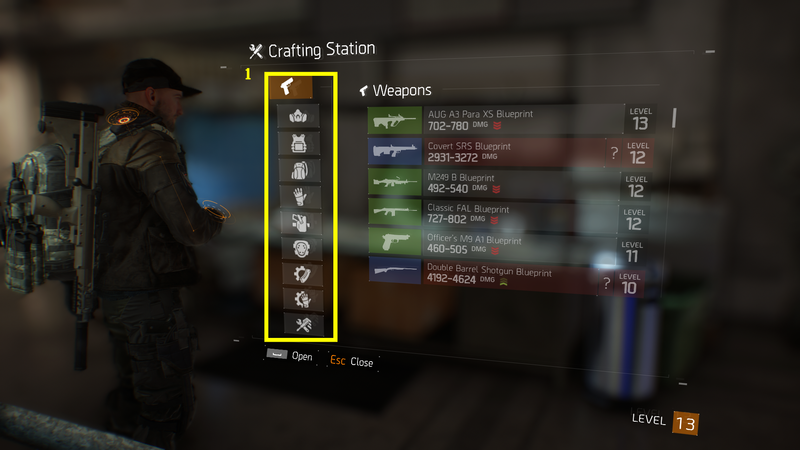 So, if you’re like me, then you’re probably wondering how important crafting is in The Division. Crafting, as it turns out is a key function in the game, most of the end gear game items require you to craft unless you are really lucky with your drops. The Division crafting system is simple, there 4 types of crafting materials and depending on what you want to craft you will use 1 or more of those mats. You do not need to level up your crafting, instead you have to unlock items’ blueprints in order to craft them. 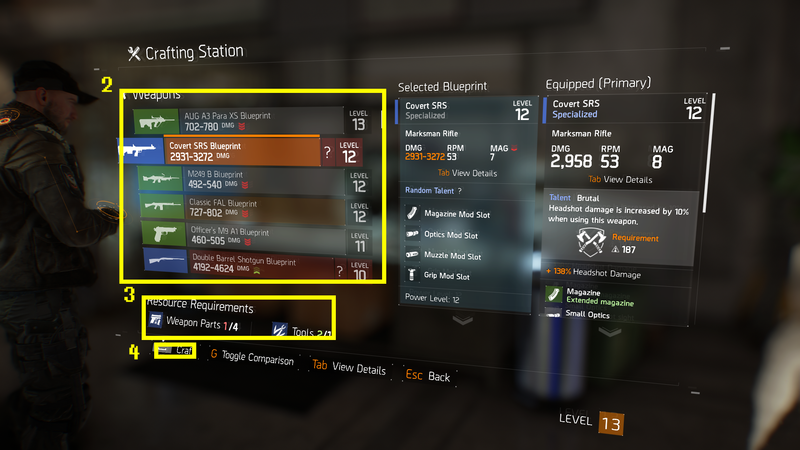 Blueprints are obtained by finding them in missions or by buying them. Below, you will find a screenshot of how the crafting system looks like, as you can see it is fairly simple. 3 simple steps to craft. (1) Choose the type of item you want to craft. (2) Choose the specific Item you want to craft. (3) Check if you have enough mats to craft. (CRAFT) Hold Space to craft the item. One more tip while crafting, you can always cycle through your gear and compare what you are currently wearing by hitting ‘G’. How do I decide whether to deconstruct/scrap vs. sell my items? This is entirely up to you and how much you want to upgrade your items as you level up. You can choose to deconstruct/scrap all your items and save the mats for the end game or you can use them to craft items to help give you a little edge when you feel you are having a hard time while leveling up. From experience, you don’t really need to sell your items, if you can wait, deconstructing/scrapping is much better for the late game. What are the crafting mats and how do I get them? How do I obtain better quality crafting mats? Where do I get Crafting Blueprints? 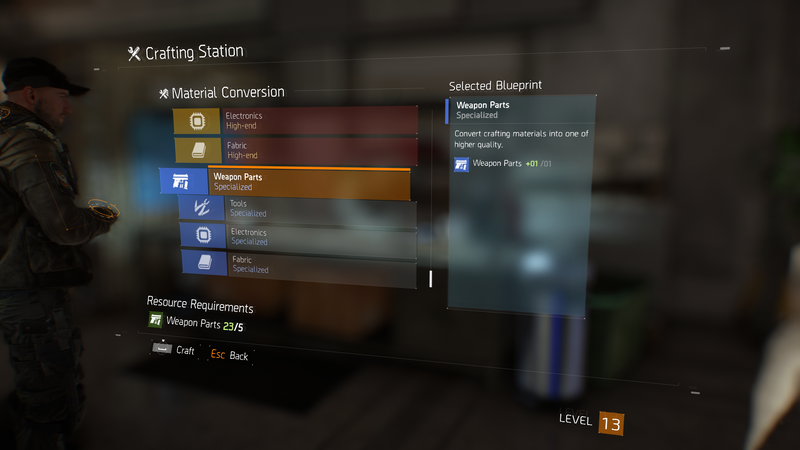 In the early game, Crafting Blueprints are obtained from completing missions but once you reach level 30 a Crafting Blueprint vendor becomes available in your Base of Operations where you can buy end game crafting recipes. Well, that’s it for this Crafting Intro.